Many employers say graduates from homegrown universities are often unemployable because job seekers do not have the skills they want. When 19-year old Pavitra Singh,one of 20 million students at India’s universities and colleges,gets her degree in two years’ time,she fears it will not be enough to secure a job. Indian employers tend to agree. Many say graduates from homegrown universities are often unemployable because job seekers do not have the skills they want,one reason why New Delhi is trying to fast-track legislation to allow foreign colleges,until now largely shut out of India,to open their own campuses in the country. 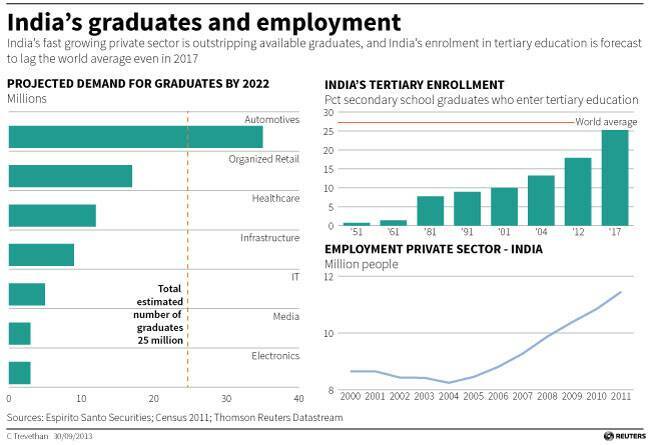 On the cusp of a boom in its working-age population,India is racing against time to raise the quality of its education to prevent a demographic dividend turning into a demographic curse. Over the next two decades,Asia’s third-largest economy will add up to 300 million people – the equivalent of almost the entire population of the United States – to its workforce. That prospect offers hope that India,struggling now with its weakest economic growth in a decade,can finally follow in the footsteps of the likes of China and the Asian Tigers. A generation ago these countries made good use of their growing workforces,training young people and putting them to work in export-orientated manufacturing,to generate economic growth that was the envy of the world. India’s working-age population will not peak until 2035,in contrast to China,where the working-age population topped out this year,brokerage Espirito Santo Securities says. Labour forces in South Korea,Taiwan and Singapore will peak in the next five years. Despite a surplus of workers,employers across sectors say local universities do a poor job of preparing graduates for working life. None of India’s universities feature in the world’s top 200,the 2013/14 rankings by the London-based education group Quacquarelli Symonds show,versus seven from China. Many homegrown universities rely on rote-learning and fail to teach the “soft skills” that are increasingly important in India,where the services sector has driven the economic growth of the last two decades,recruiters and students say. “We don’t learn here – we are just taught to mug up,so it’s hard for us when we go out to find jobs,” said Singh,an undergraduate at one of the country’s largest private colleges,Amity University,referring to the teaching style across India. Foreign universities have been largely shut out of India,allowed only to open research centres,teach non-academic courses or offer degree courses with a local partner. Now,the government wants to offer them the more lucrative option of opening their own campuses. India’s ministry of human resources and development is trying to issue what is in effect an executive order,which would leapfrog a bill stuck in parliament since 2010,one casualty of a legislative logjam that has paralysed Indian policymaking over the last two years. Despite scepticism from many institutions that India will be able to change its game with elections looming by next May,some foreign universities are keen to push ahead with campuses. “A campus in India has always been our vision and that is our plan,” said Guru Ghosh,the vice-president for outreach and international affairs at Virginia Polytechnic Institute and State University,known as Virginia Tech. It is due to launch a research centre near the southern Indian city of Chennai in spring 2014 and hopes to set up a campus within 3-5 years if the rules change,Ghosh said. Under the proposed rules,non-profit foreign universities in the top 400 worldwide would be able to open campuses. The rules need a final sign-off from the law ministry,which will take up to three months,according to R.P. Sisodia,joint secretary for higher education at the Ministry of Human Resources and Development. While India has dithered,other Asian countries have moved ahead,with foreign universities in Malaysia and Singapore attracting Indian students. Spokespeople for Stanford University,the University of Chicago,Duke University and the U.K.’s University of Northampton told Reuters they had no plans for a campus in India,even though they all have or plan to have research centres or offer courses on a local campus. Foreign colleges would only meet a tiny portion of India’s demand for places,but their presence would put pressure on domestic counterparts to improve,higher education experts say. To be sure,India’s planning commission has set a target of creating 10 million more university places in the next few years and boosting funds for the top domestic universities to try to elevate them to the ranks of the world’s top 200 by 2017. If India fails to harness its population boom over the next two decades,its demographics could be “a disaster – not a dividend”,Espirito Santo said. “A major shortage of jobs in the economy,or a skills mismatch,would create a young,angry and frustrated population,” its report said.